It is a major suburb of Louisville: when the Louisville Metro government was established in 2003, Jeffersontown remained an independent city. It is the metro area's third largest municipality outside of Louisville. Located in southeastern Jefferson County, Jeffersontown came into being in the late 1700s as a stopover for early pioneers on their way to the Falls of the Ohio at Louisville. Farmers began to cultivate the rich land, which was surveyed by Thomas Bullitt in 1773 and John Floyd the next year. The Hites, Tylers, and Oldhams all settled the area under land grants for military service. In 1794, Abraham Bruner purchased 122 acres of land. In May 1797, he successfully petitioned the Jefferson County Fiscal Court to incorporate a 40-acre section of his land as the city of Jefferson – either after the county or after Thomas Jefferson, then the vice president of the United States, directly. The city was long known as Bruner's Town or Brunerstown by its inhabitants, but the usage Jefferson Town eventually led to its present name. Jeffersontown is located at 38°12′22″N 85°34′25″W﻿ / ﻿38.20611, -85.57361 (38.206102, -85.573619). According to the United States Census Bureau, the city has a total area of 10.0 square miles (26 km2), of which 9.9 square miles (26 km2) is land and 0.10% is water. As of the census of 2000, there were 26,633 people, 10,653 households, and 7,275 families residing in the city. The population density was 2,675.9 people per square mile (1,033.5/km²). There were 11,220 housing units at an average density of 1,127.3 per square mile (435.4/km²). The racial makeup of the city was 86.74% White, 8.65% African American, 0.21% Native American, 1.77% Asian, 0.03% Pacific Islander, 1.14% from other races, and 1.46% from two or more races. Hispanic or Latino of any race were 2.54% of the population. There were 10,653 households out of which 32.9% had children under the age of 18 living with them, 54.3% were married couples living together, 10.7% had a female householder with no husband present, and 31.7% were non-families. 26.4% of all households were made up of individuals and 6.4% had someone living alone who was 65 years of age or older. The average household size was 2.46 and the average family size was 2.99. In the city the population was spread out with 24.8% under the age of 18, 7.7% from 18 to 24, 33.4% from 25 to 44, 23.3% from 45 to 64, and 10.8% who were 65 years of age or older. The median age was 36 years. For every 100 females there were 92.8 males. For every 100 females age 18 and over, there were 89.1 males. The median income for a household in the city was $51,999, and the median income for a family was $60,951. Males had a median income of $41,345 versus $29,537 for females. The per capita income for the city was $23,977. About 3.7% of families and 4.3% of the population were below the poverty line, including 5.4% of those under age 18 and 5.4% of those age 65 or over. Papa John's Pizza has its headquarters in Jeffersontown. The city of Jeffersontown is governed by a mayor and eight city council members. The mayor serves a four-year term of office while the council members serve two-year terms. The city council is elected from the top eight candidates receiving the most votes in the general election. ^ a b The Kentucky Encyclopedia, pp. 468. "Jeffersontown". University Press of Kentucky (Lexington), 1992. Accessed 1 Aug 2013. ^ Commonwealth of Kentucky. Office of the Secretary of State. Land Office. 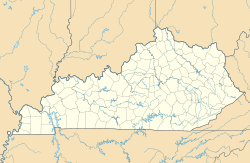 "Jeffersontown, Kentucky". Accessed 1 Aug 2013. ^ Rennick, Robert. Kentucky Place Names, p. 152. University Press of Kentucky (Lexington), 1987. Accessed 1 Aug 2013. ^ "Jeffersontown, Kentucky - Viewbook". Communitylink.com. 2003-01-06. http://www.communitylink.com/us/ky/jeffersontown/profile/biz.htm. Retrieved 2009-08-05. ^ "Jeffersontown to dedicate new bike and walking path Saturday." The Courier-Journal. November 7, 2007. C7. Retrieved on December 6, 2012. "Papa John's office is in Jeffersontown,"
^ "Papa's Specialty Pizza Challenge." Papa John's Pizza. Retrieved on December 6, 2012. "Papa John's International Inc., 2002 Papa John's Blvd, Louisville, KY 40299." This page uses content from the English language Wikipedia. The original content was at Jeffersontown, Kentucky. The list of authors can be seen in the page history. As with this Familypedia wiki, the content of Wikipedia is available under the Creative Commons License.